(Al Hartmann | The Salt Lake Tribune) Florian Solzbacer, president-executive chairman of Blackrock shows the computer chip they developed that is implanted in the brain of amputees or paraplegics. The chip allows them to move robotic devices like prosthetic limbs. When Nathan Copeland met then-President Barack Obama last year they exchanged a fist-bump that was far from the ordinary fist-bump. Copeland has been paralyzed from the chest down for more than a decade, the result of a car accident when he was a teenager. But a device — pioneered in Utah — was able to read his thoughts and tell a prosthetic arm to make a fist and bump knuckles with the president. What’s more, he got “touch” feedback from the mechanical limb — Obama’s hands were warm. Now the scientists who have been refining and improving the technology want to go further: They want a paralyzed patient to drive a car using only his or her mind. It’s being called The Speed Project. Florian Solzbacher, a co-founder of Blackrock Microsystems, said the goal is to show a mass audience that it’s science is pushing the medical frontier into new territory. 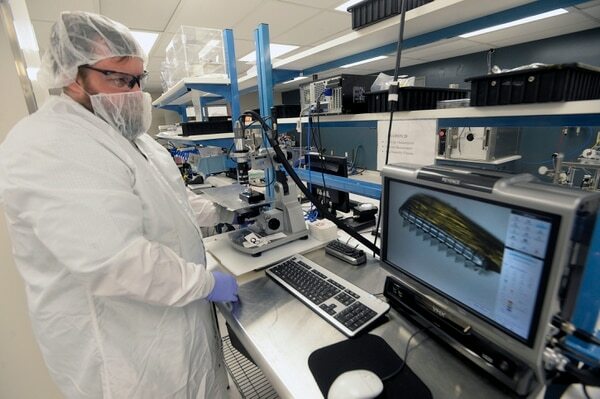 (Al Hartmann | The Salt Lake Tribune) Technician Chrisman Cook finishes assembling array in the clean room at Blackrock. The company has developed a computer chip that is implanted in the brain of amputees or paraplegics. The chip allows them to move robotic devices like prosthetic limbs. “There are people we can help today, we know that, so let’s go out and create something where vast parts of the population get it, where it becomes emotional,” he said. The device they’re implanting, the Utah Electrode Array, is a chip, about a half-centimeter square with a hundred tiny little spires, each tipped with a sensor. 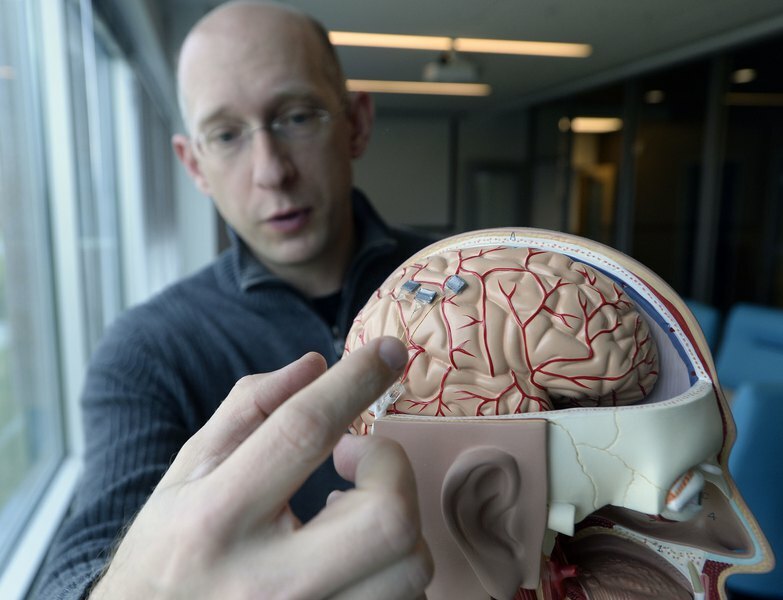 It is implanted on the surface of the brain and monitors neural signals, transmitting massive amounts of data to a receiver that uses algorithms to filter out the background noise and translate the patient’s thoughts into action. The Utah Array was developed in the late 1990s by Richard Normann, a University of Utah professor, and later spun off into Blackrock Microsystems, headquartered at the nearby Research Park. “If all this Speed Project does, even if it doesn’t prove there’s a billion-dollar market, if it proves we can have a solution for a thousand [paralysis] patients or Locked-in [syndrome] patients, guys who lie there, hear everything, often feel everything but cannot respond, just imagine,” said Blackrock CEO Marcus Gerhardt. 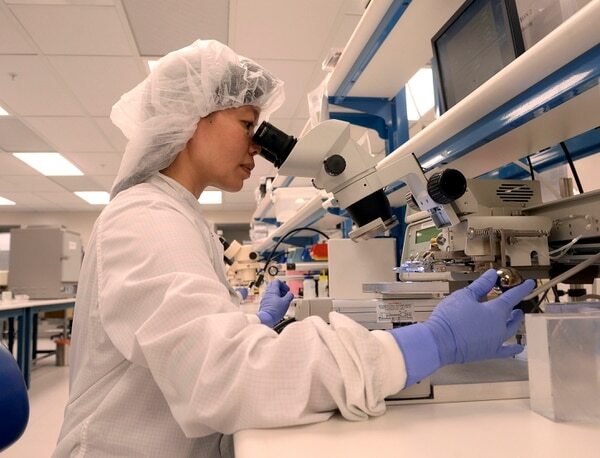 (Al Hartmann | The Salt Lake Tribune) Technician Hoa Nguyen carefully assembles chip array looking through a microscope in the cleanroom at Blackrock. The company has developed a computer chip that is implanted in the brain of amputees or paraplegics. The chip allows them to move robotic devices like prosthetic limbs. 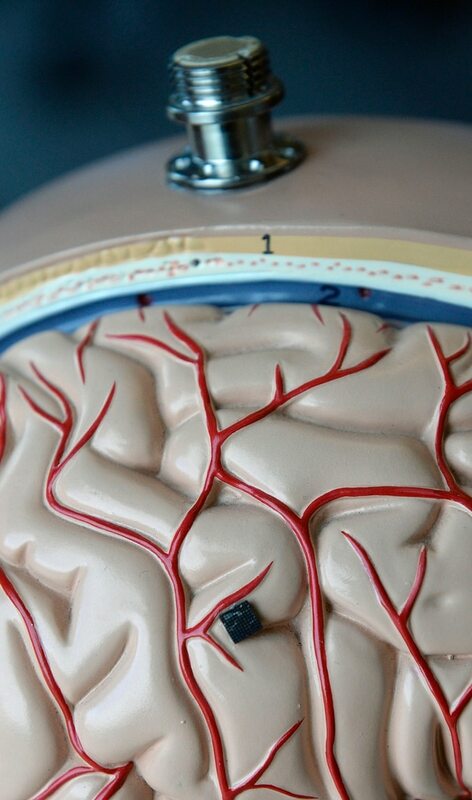 Solzbacher and Gerhardt have been working with doctors at Johns Hopkins Applied Physics Lab to begin screening and selecting patients and by November hope to implant the device on the brain of their driver. They are working to recruit one of two potential car manufacturers that will provide the vehicle and Paravan — a company that outfits vehicles for drivers with paralysis or other disabilities — will install the receiver that will tell the car to accelerate, stop, turn or back up. And here’s a little twist: The driver will be in a facility in Baltimore, driving a car that is a couple thousand miles away, probably either in Utah or California, Solzbacher says. That is, at least, in the first phase of the project. Next year, they want their driver to attempt a land-speed record during Speed Week on the Bonneville Salt Flats, this time with their driver seated in the vehicle. Ultimately, the goal is a more practical application, and the third phase of the test will be to have the patient use his or her mind to move a wheelchair toward the vehicle, get inside, and drive in city traffic. (Al Hartmann | The Salt Lake Tribune) Blackrock has developed a computer chip that is implanted in the brain of amputees or paraplegics. The chip allows them to move robotic devices like prosthetic limbs. Square black chip (middle bottom) is connected by a human hair-sized wire to an exterior port, top. “The dream is, at the end of the project, to have the patient control their wheelchair, get out of the house, drive their own car, drive through downtown … or drive on the field at the Super Bowl with 200 million people watching,” Solzbacher said. This is all possible today, he said. What’s missing is the deep pockets — either charitable contributions or venture capital — to ramp up the scale of the technology and drive the research on the applications for the array in new directions. There is already cutting-edge research that is being done in labs in the United States and Europe and it is even more mind-blowing. Scientists are using the array to monitor brain waves in epilepsy patients to see if the neuron traffic signals a seizure. And because the sensors can transmit information, as well, researchers in the Netherlands are in the early stages of using the device for the vastly more complex purpose of helping blind people “see” shapes in front of them. The Department of Veterans Affairs is helping to fund research to enable amputees to use prosthetic limbs and give them back some measure of self-sufficiency. And the Defense Department is intrigued by the idea of using pilots implanted with the array to fly planes, because the reaction time would be almost instantaneous, manual error would be eliminated and the pilot would likely not even have to be in the jet. Long-term, says Solzbacher, the goal has to be to get the U.S. Food and Drug Administration to approve the permanent use of the chips. Since all of the current uses for the device are experimental, once the experiment is over, the array has to be removed and the patients lose whatever progress has been made. It would mean a profound loss of freedom for patients like Ian Burkhart, who was paralyzed from the shoulders down after an accident at the beach when he was 19, but was implanted with the array and a sleeve of electrodes that bypass his severed spinal cord and tell muscles and tendons in his actual arm when to move. Gerhardt and Solzbacher are also hoping The Speed Project enhances Utah’s profile as a place for pioneering innovation.